So you have a tinny and you have an outboard – your first step to adventure is complete! But before your adventure begins, where will your tinny and outboard go? Storing your tinny, moving your tinny and getting all of your things together is a big job. With a heavy engine to worry about, the job can easily get even bigger! Moving a tinny and an outboard on your own is hard work. However, luckily, there’s a solution: a customised outboard trolley! 1. Lifting your outboard alone is nothing short of dangerous! Every great adventure comes with a price – after all, packing the car up with your tinny is hard work! But that’s all worth it for the fun you’ll have right? Not if you injure yourself. Even the smallest outboards might seem manageable, but they still pack some serious weight. And to make it worse, outboards are a very cumbersome shape. Getting a good grip and keeping your posture right is a bit tricky. So don’t risk it – you need your back to be in good condition when you hit the water, so get an outboard trolley! Moving your engine with an outboard trolley from Almac Trailers is little more than an afterthought – it is just that easy! 2. Need to work on your outboard? It’s easier with a trolley! So you’re making your way down the pre-trip checklist. Everything is looking good, but one final task awaits you: the dreaded outboard service. Even a simple run over with some water dispersant can be challenging without a good solid mounting point for your outboard. With an outboard trolley, you get a good solid mounting point and better still – it’s mobile! On an outboard trolley, your motor will stand upright at a nice workable height, which will make your check over and service easy and comfortable! When you bought your tinny, you probably had a great storage space in mind. Perhaps it was a corner of the shed with perfect dimensions, or maybe a nice pocket down the side of your house. But did you remember to think of your outboard? Storing your tinny with an outboard attached narrows your options a bit. 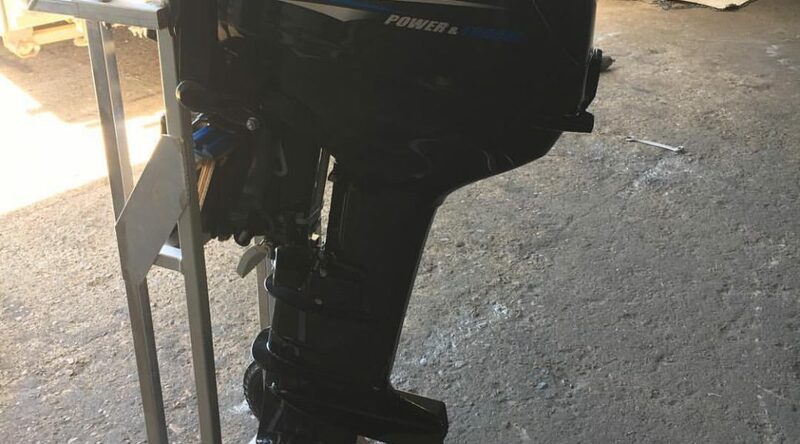 Outboards aren’t that well suited to being exposed to the elements and they add some extra length that may make it hard to find space undercover. Your next best option, then, is to take the outboard off and store it separately. That’s a nice easy fix! But how will you move it around? Well, the answer to that is even easier: with an outboard trolley! Getting an outboard trolley will make your motor storage as easy ever. Almost everyone who has had to move an outboard by hand is probably familiar with the sinking feeling that comes with dropping it. Outboards are pretty hardy, but they can only take so many hits before the damage shows. Whether it is the cowling, or the prop, your outboard stands to sustain some pretty serious damage if you drop it. Even from a relatively low height. That’s why you need a safe, sturdy way to move it about. And the safest, most sturdy way is with an outboard trolley from Almac Trailers. Outboard trolleys are purpose-built to move outboards over different types of terrain with stability and ease. So even if you have to get your outboard from the car to the water, an outboard trolley is still the tool for the job! Don’t risk the damage to you or your outboard – play it safe with an outboard trolley. Contact Almac Trailers today for the best quality outboard trolleys for your motor! Previous Post5 Essential Boat Trailer Maintenance Tips You Need to KnowNext Post5 Reasons You Need A Rooftop Boat Loader!